When it comes to stocking healthy staples that make life easier, Trader Joe’s slays the game. Case in point: cauliflower pizza crust, 99 cents sparkling-water, and pre-chopped herbs. The “everything but the bagel seasoning” is their latest addition to the spice aisle. This versatile blend packs in black and white sesame seeds, sea salt flakes, poppy seeds, and minced garlic. You counted right—that’s five flavors in one. With just a flick of your wrist, you’ll have one seriously tasty dish. No sticky garlic hands necessary. According to Tracy Lockwood, RD, founder of Tracy Lockwood Nutrition, this ingredient is also one of the healthiest foods you can add to your cart at TJ’s. One serving contains just 80mg of sodium—you want to cap it at 2300 a day—making it a stellar pantry staple for turning your cooking from bland to bam. Can this spice combo really live up to its name? Well+Good challenged three healthy food bloggers with dreaming up recipes imaginative enough to redefine “everything.” The results? A trio of recipes tasty enough to almost steal you away from your love affair with Himalayan sea salt. Below they share a killer combo of bagel-inspired dishes that harness the power of apple cider vinegar, elevate your afternoon snack attack, and pack in some zesty omega-3s at dinnertime. Your gluten-free, vegan brunch is about to get a makeover. Plant-based health coach, Ilene Godofsky, remixes the classic NYC Sunday lox with this vibrant dish. As if vegan waffles weren’t cause enough for a full-on celebration, apple cider vinegar is incognito in Godofsky’s creamy batter. Post-brunch glowy skin? Yes, please. 2. In a large bowl, whisk the spelt flour, one tablespoon of the everything bagel seasoning and baking powder together. 3. In a small bowl, stir the nondairy milk, coconut oil, maple syrup and apple cider vinegar together. 4. Stir the contents of the small bowl into the large bowl, and mix until the batter is smooth. 5. Grease the waffle iron with coconut oil. Pour some of the batter into the waffle iron and sprinkle extra everything bagel seasoning on top. Cook until the waffle is golden and slightly crispy. The amount of batter and cooking time will vary depending on your waffle iron. Repeat, until all the batter is used. 6. 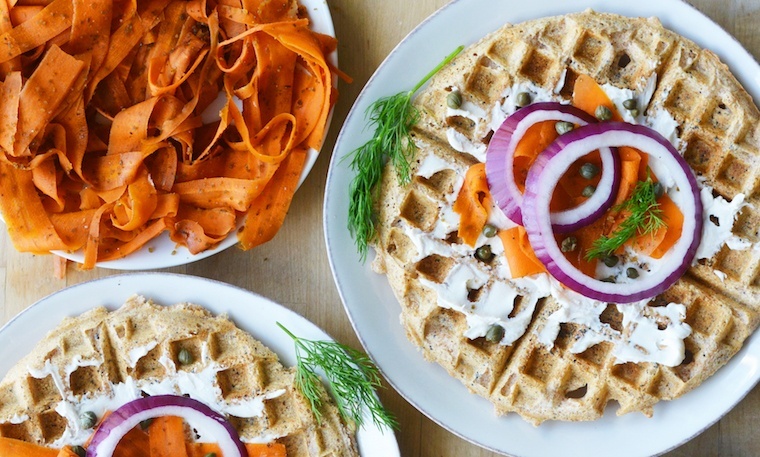 To serve, spread vegan cream cheese on the waffles and top them with carrot “lox,” red onion slices, capers and fresh dill. 1. Preheat oven to 400°F. Line a baking sheet with aluminum foil. 2. Use a vegetable peeler to peel carrots into thin strips. Place in a bowl and toss with tamari, liquid smoke and seasoning. 3. Place on baking sheet. Fold aluminum foil around carrots so they are completely covered. Bake for 20 minutes. 4. Remove from oven and let cool (place in the fridge to speed this up). Serve on top of the waffle. You can add this snack to your list of go-to bites for keeping the afternoon munchies at bay (along with yuka Cheetos). 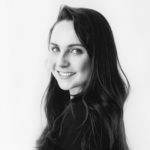 Emilie Hebert, veganista behind Emilie Eats, is all about out-of-the-box plant-based snacks, and these chips are no exception. 3. Thinly slice the yuca. Place slices into a bowl. Add oil and everything seasoning. Toss to coat slices evenly. 4. Place slices on a baking sheet. Bake for 20 minutes. 5. Flip and bake for another 15-20 minutes, until crispy. Texture is half the battle when it comes to cooking, which is why nutritionist Kate Gavlick, CN, of VeguKate uses the everything bagel spice to give a healthy salmon dish a satisfying crunch. Starring avocado and quinoa, this dinner is simple (AKA perfect for busy weeknights), yet packed with flavor. 1. Preheat oven to 400ºF and line a baking tray with parchment paper. 2. Place salmon on lined baking tray and drizzle with avocado oil. Sprinkle with everything bagel seasoning and use your hands to pat into salmon. 3. Bake salmon for eight to ten minutes, or until it flakes easily with a fork. 4. Remove from oven and drizzle with lemon juice. 5. Serve alongside roasted vegetables and greens, if desired. If your spice cabinet needs a refresh, pick up these 5 staples—stat. Prefer your spices in PSL form? Here’s how to make a healthy one at home.